The controversial mailer shows an apparently edited image of Matt Lesser, the Democrat running for State Senate 9th District, clutching $100-dollar bills and a written message that “Matt Lesser Will Take Everything You Worked For.” Some say the mailer targeting the Jewish candidate is anti-Semitic. The fallout over a campaign mailer sent to Connecticut voters that some argue is anti-Semitic continues to grow. 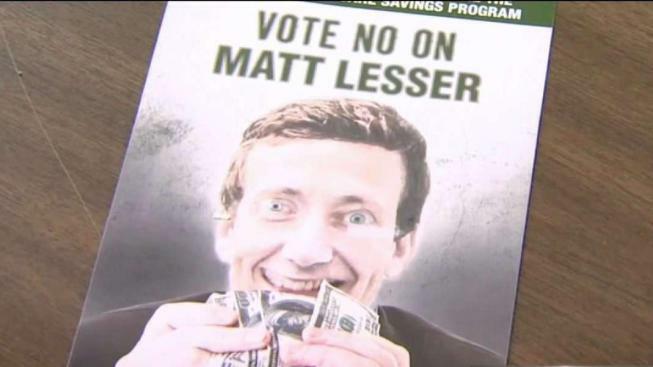 That mailer was sent by Ed Charamut’s state senate campaign and depicts what appears to be a doctored image of his opponent Matt Lesser, who is Jewish, with wide eyes grinning while gazing at several hundred dollar bills. At an event to denounce the mailer Wednesday morning, Lesser said in a week when 11 people were killed in a synagogue for practicing their faith, an apology for this mailer simply isn’t enough but it’s a place to start. “It’s astonishing. It’s deeply hurtful. It’s not something I thought I would ever have to live through,” he said at the event that included faith and civic leaders speaking in opposition to the mailer. Critics say the message of anti-Semitism couldn’t be clearer. “You cannot pretend that it doesn’t mean what it was meant to mean. So today, we have to condemn that mailer,” said Hartford Mayor Luke Bronin. Republicans Protest Group Voter Registrations in Conn.
Wethersfield resident Alyse Black says she picked up on what she thinks was the mailer’s true intent. “I don’t think that in this day and age you can look at an image like that or feel the anti-Semitic things that are going on or anything else that going on in this world and pretend that is just simply tax related or simply money-related,” said Black. Wednesday, Lesser was asked if he believed Charamut should get out of the senate race. He told NBC Connecticut he’d leave that decision his opponent, but believes the mailer’s message is a disqualifier from public office. “My hope is that the public on Tuesday will vote and vote against hatred and division, bigotry and anti-Semitism,” said Lesser.